As you may already know, Tokyo is not the most friendly city for vegans or any kinds of vegetarians. Vegan or vegetarian restaurants are hard to find and good ones always end up expensive. I have a few vegetarian friends and they all tell me that they end up eating at home. I am not a vegetarian myself but from my vegetarian friends votes and my votes as non-vegetarian, here is the list of the best affordable vegan and vegetarian restaurants in Tokyo. Lotus & Flowers One has been one of the most popular vegan restaurants in Tokyo and now announced for its renewal in 2018 January. It definitely is not a big restaurant so don't forget to reserve before you go. This Italian vegetarian bistro does not use broth from meat or seafood so you do not need to worry about that. However, some menu is reliant on eggs and cheese, so you need ask the staff. During the dinner time, they only serve course. Another cool thing here is that they only serve bio wine which I love! You can order by glass too. If you want to eat some savory burgers, this is the place to go. This small vegetarian burger cafe is located just a minute away from Seibu Shinjuku Station. Even if you are not vegan, you will enjoy their food. All menu is vegan which includes burgers, burittos, salad and sweets. Also, Each counter seats has outlet. How nice! When it comes to ramen, it could be hard to find a vegan friendly shops but here, it's all vegan ramen! One of my non-vegetarian friend go here with her vegan boyfriend and she loves it. 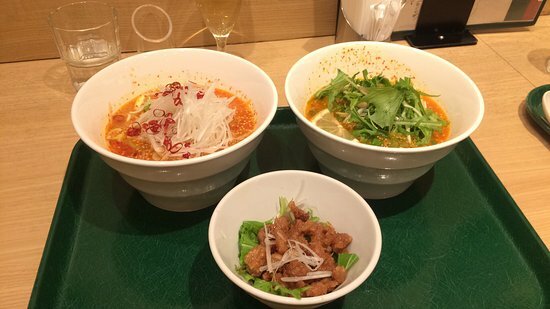 T's Tantan can be found inside of Tokyo Station, just by the pathway to Keiyo Line. Tantan ramen is usually spicy but here you can order ''plain'' for less spice. Sasaya Cafe is an organic & vegan cafe located near Kinshicho Station and Honjo Azumabashi Station. This building is a renovated warehouse so it's very specious. One of the popular menu is Chickpea Curry is tasteful. You can taste various spices and cannot stop digging into the plate. Tamana Shokudo, previously known as Natural Food Studio offers beautiful menu with a mix of Traditional Japanese fermfermentated recipes and Macrobiotic principles with a touch of French. DevaDeva Cafe is popular among not only vegans but also organic and natural foods lovers. Their delicious dishes are all free from additives, chemical seasonings and white sugar. There are some dish that has cheese so you should ask before order if you are pure vegan. Another great things about this cafe is the portion. Many vegan or vegetarian type of cafe in Japan do not offer big portion but you can be very satisfied here. Yay! It's fully vegan here!Choabuzen is a vegan & oriental vegetarian friendly restaurant. Their menu is mainly Japanese like ramen, curry and other cool side dishes. One of the popular menu is vegan soup curry which you can taste all kinds of spice. Also they have menu written in English, Chinese and Korean. This Falafel store, at first, seems like a new trendy apparel stores or something so it might be hard to find but their food is straight forward. Their Falafel sandwich is FILLED well with fresh fried falafel, fresh veggies, grilled egg plant and hummus. It's HUGE. Eating it with spicy sauce is just unforgettable.